Training days and working test…..the end of a season of competition. Three days after Bertie won his final Green star to gain his Irish Show Champion title we were on the road again and heading to England for our final trip of the year. Formal education has finally caught up with us, so on this occasion Des and Elly remained home. Bertie won his final Green star for his Irish Show Champion title at Carlow and District Champ Show. This was going to be a long one both in time away from home and distance travelled. My destination was all the way to the south of England. All across North Wales then down through the midlands where I would be sharing a cottage with my good friend and fellow chessie owner Gerlinde. She had travelled all the way from Austria the previous Sunday, with her five dogs Nico, Bella, Lilu, Vivian and Cashew, to meet up with Jason Mayhew for some training. This was also my main reason for extending the length of my trip. 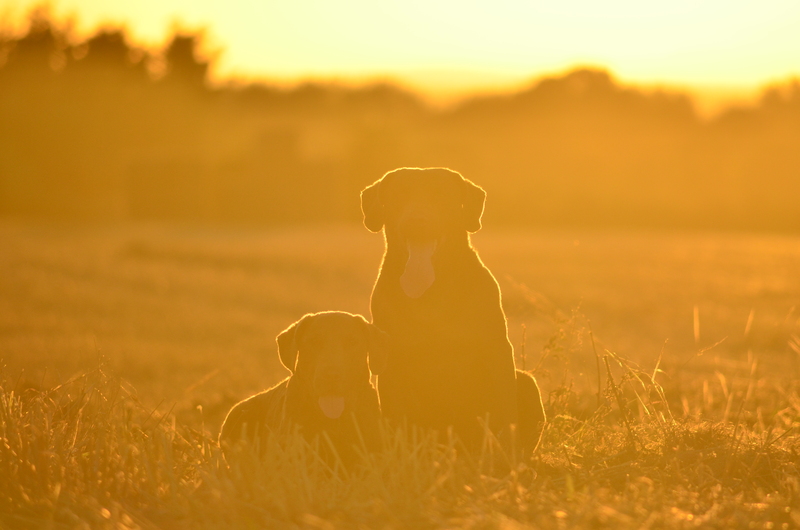 The opportunity to work with the dogs under the guidance of somebody else would make a pleasant change from pounding the fields alone. I was taking two dogs, Bertie and Uisce. My time training with Jason and Gerlinde would be mostly for Uisce’s benefit. She now needed experience watching other dogs work and learning to focus in strange surroundings with multiple distractions. The working test on Sunday then, would give me some idea as to where exactly she is in training. The south of England is as different from Derbyshire, where we travelled to in August, as any part of the same country can be. Derbyshire is more Emily Bronte, wild and windswept whereas Sussex and its neighbouring counties are more Jane Austin. 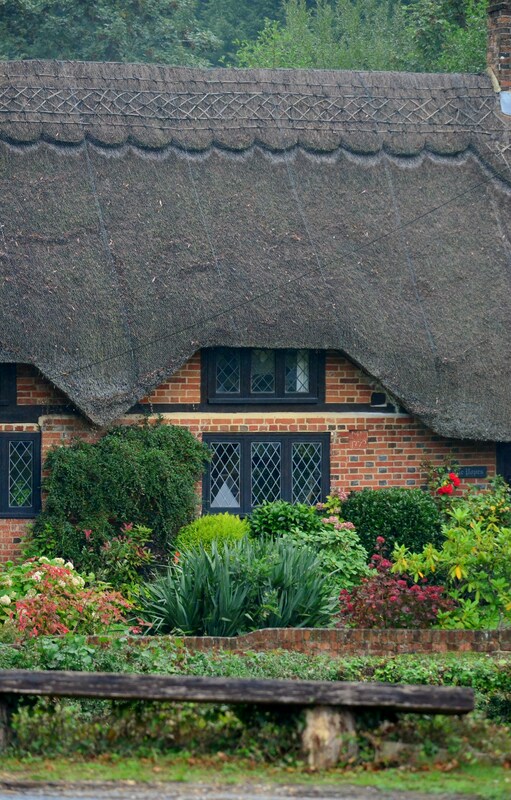 It is softer, more sophisticated in ways and utterly English; I could almost hear the clink of china cups as I drove through the myriad of villages where old oak framed cottages clustered around cricket greens and the narrow winding streets draw you in, making you curious as to what delightful little shop lies around the next corner. After thirteen hours of travelling we arrived weary but welcomed by Gerlinde and her gang to the cottage in Ockley village. Finding a house to accept and accommodate seven dogs in an area accessible to the training grounds was a challenge but I was pleased to find Vann Cottage pretty much ticked all the boxes in relation to a holiday with dogs. Set at the end of a long single track the cottage stood on its own grounds with a secure back garden. A public footpath ran by the side of the house which brought us immediately to open pastureland, with no livestock to worry about and acres of wonderful old oak woodland. 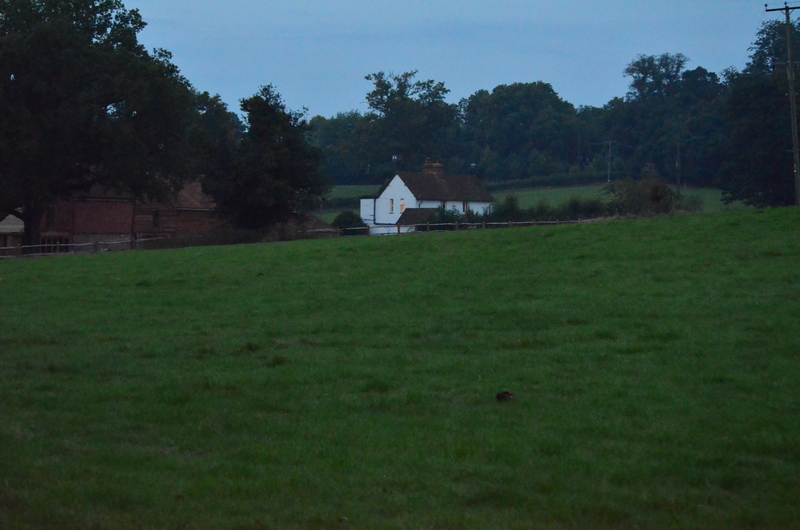 We could literally open the back door and step into the fields it was dog heaven. The cottage at Ockly, dog heaven. There was just enough light left in the sky to take Bertie and Uisce for a much needed gallop across the paddock then once I had fed them and settled them in the living room it was time to sit down and enjoy a steaming bowl of Gerlinde’s homemade pumpkin soup, fresh bread and a glass of wine while I caught up with her exploits in the preceding days and how she was enjoying the training. In the three days she had been working with Jason they had changed ground each day, working on the very basics with her young puppies to more technical work with her advanced level dogs. 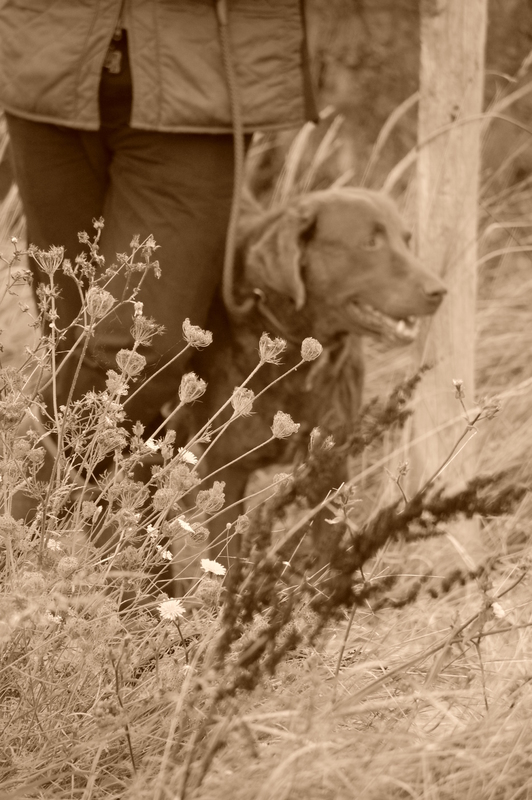 Our plans for training were to work on aspects which we both have been struggling with our dogs. Attending the working test at the end of the week would be a lovely way to finish but it was for the training and chance to work with Jason that were our primary reasons for travelling so far. Gerlinde’s baby Cashew loved her week’s training. Thursday and Friday were long, full, busy days. I was up and out of the house with the two dogs each morning at first light. Off across the fields where the tawny owl was hooting sleepily in the woods to the right and the roe deer were dancing across the chickpea crop in front of us. Back for a quick breakfast where Gerlinde had my coffee ready and by 9am both days we were on the road and joining the morning traffic on our way to the appointed training grounds. Every trainer has a different way about how they work with dogs and inevitably each dog handler will find a person that ‘clicks’ with them to get the best from their individual dogs. In the past year I have had the opportunity to work with many trainers, some top of their field in competition but maybe not always the best teacher. Jason’s approach works for me. 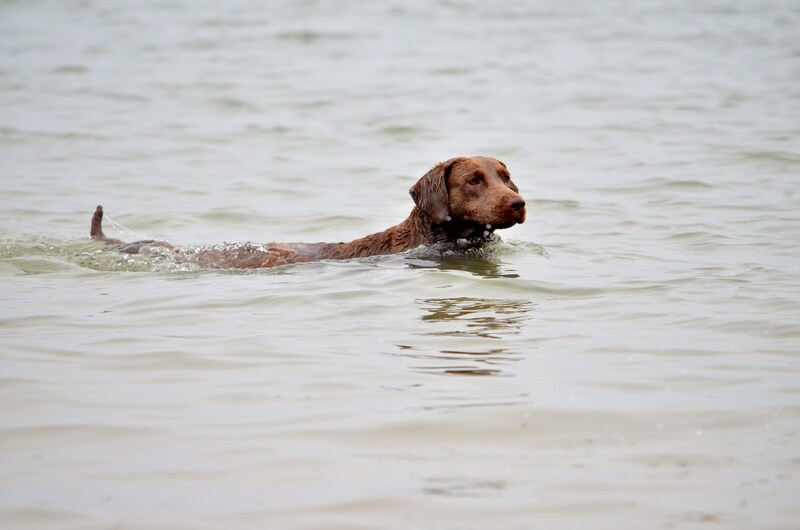 It is built around a simple premise of breaking down each aspect of retriever training to its most basic level and working forward from there…once each individual lesson is learnt it is simply a matter of joining the dots. 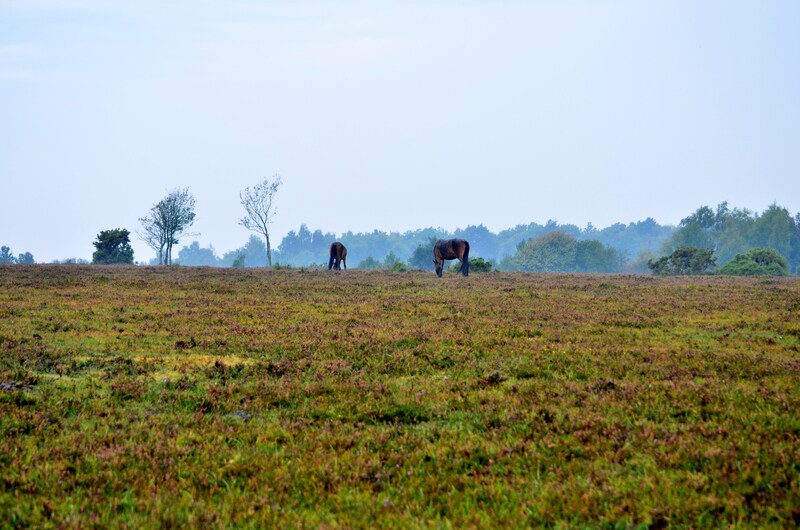 England offers wonderful places to walk….the New Forest. After two days of intense training much had been worked on and accomplished. There were lots of ideas to bring home and plenty of information for Uisce to digest and chew on. 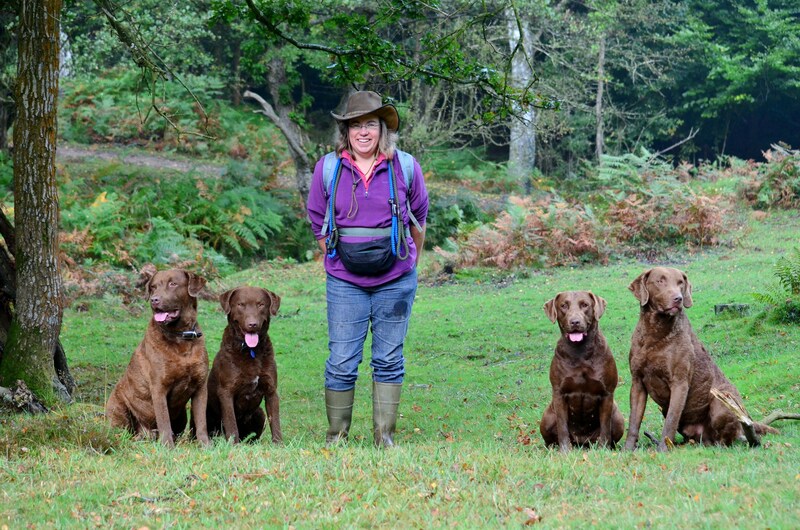 By Saturday it was time to take a break and have some fun with the dogs so we headed further south and west to the New Forest where I met up with my good friend Jo and her wonderful chessie boys Teague and Rana. Our paths had not crossed much this year in our travels to the UK but the New Forest was a half way point between where I was staying and where she lived so I thought it well worth investigating. Driving rain hit the windshield as I headed southwest that morning. Too late I realised I had left my jacket at the cottage but by the time I had pulled into the carpark of The Dragon pub in Brook village it was like entering a different world, the clouds cleared, the sun broke through and there were horses everywhere and I mean everywhere. They were grazing on the village green, wandering through the local golf course and walking lazily across the main roads that cut through the national park. Every turn in the path on our walk they were there lifting their heads without concern as we passed them by with our four brown dogs. After almost two hours of walking and meeting these beautiful beasts I can safely say that both Uisce and Bertie are socialised to horses! Meeting up with Jo, Rana and Teague for a walk. It was such a wonderful way to spend the afternoon, walking through the most beautiful countryside, catching up with a friend (one that I don’t see enough of) as our four brown dogs meandered through the woods in front of us. Then, to finish off a long leisurely lunch back at our starting point, The Dragon pub. Crufts, hopefully, will be our next meet up. The days had gone too quickly and Sunday came round too soon. Time spent with friends and in good company always feels so. Gerlinde and I bade a fond farewell to our little cottage and once more headed south with our pack of brown dogs. We were headed to a place near Petworth, the venue for the working test. It was a perfect location for a gathering of water-loving dogs. Set in well off the road the venue was part of a shoot where some of our club members are lucky enough to work and train their dogs. This was a managed carp farm so a series of interlinking ponds provided the perfect setting to run a test with an emphasis on water work. Help is always close by at chessie working tests. The working test this year had drawn a record entry of 34. Nine dogs were from overseas. Our Judge was Mr Chris Rose who I found to be fair with both the tests set and his scoring. He made the best use of the ground available by including water work in over fifty per cent of all tests set. Uisce was a week too old to enter the Puppy class so I had entered her Not For Competition in the Novice Dog/ Novice handler class to see how she’s cope. Was Uisce ready for competition? It’s been a few years now since I’ve stood on the line with a young dog at the very start of their working competition career. It’s easy to get comfortable running a dog that knows fairly well what they’re about, if mistakes are made whether they take a wrong line initially or misread what I as the handler has asked of them, they still have the knowledge and I have the ability to steer them back on course. Although I knew exactly where I was in Uisce’s training, what her capabilities were and are and was more than prepared to help and to guide her through the day I underestimated the effect of factors which were beyond my control….my nerves, being around a lot of other equally young dogs who were also as excited and bemused as she was by the event, gun shot being used on retrieves etc. 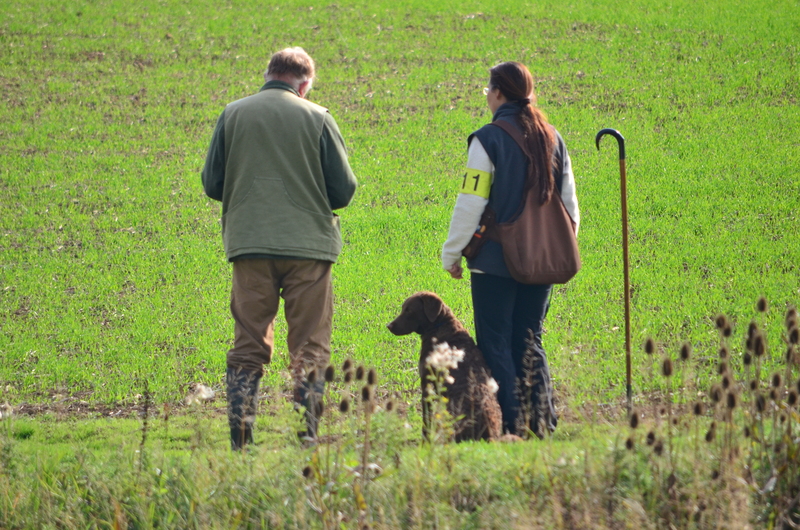 She coped well, her first two retrieves were exactly what I’d hoped for; she was quiet and steady on the line for her mark, she went straight out with drive and style, found her mark without help and straight back with delivery to hand. Her first water mark, again was nice and clean just a small readjustment of the dummy on the bank but immediately picked it up and another nice hand delivery. The third retrieve caused her problems simply because it was a scenario that she’s been struggling with in training which was crossing a body of water and banking on foliage the far side; so again no surprise just an aspect of training we’ll have to build on through the winter with the help of the odd freshly shot duck or two!! We continued on into the Beginner working test. This is quite often the trickiest level to do well in. 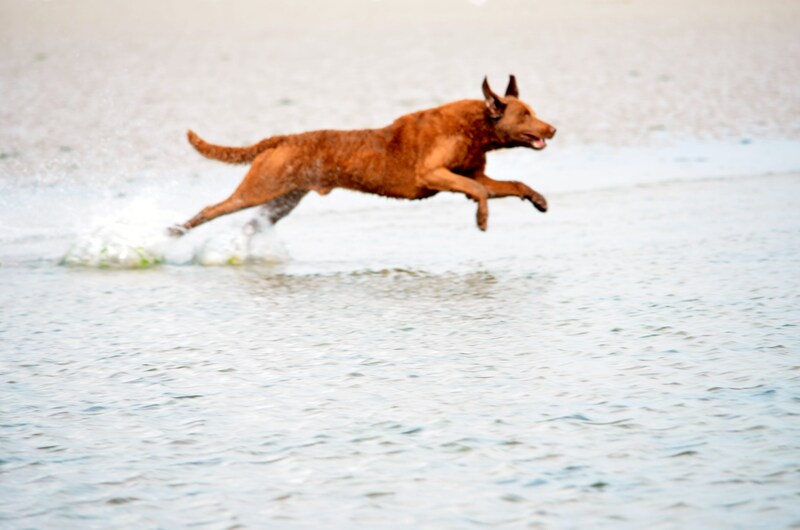 There is generally significant age variation among the dogs entered so levels of experience can come into play. I intended to use this class again as a training experience for Uisce and if she messed up it didn’t matter. Today, for her, was all about learning. The first retrieve was a double, something we hadn’t worked on much. 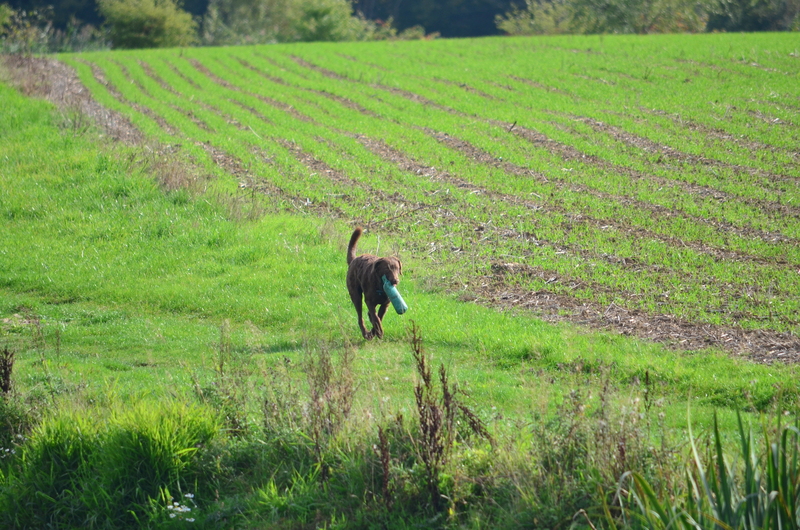 She did a lovely retrieve from water, struggled a bit on the land but with the judge’s permission I walked her closer to the thrower and with another dummy thrown she was off with her usual drive and enthusiasm. In hindsight, I should have stopped there with her. When I stood on top of the bank for the next retrieve as the judge explained the test. I looked out across the pond to where the thrower was set up and thought, ‘holy cow!!! that’s long but….’ and there’s always a ‘but’, isn’t there? The retrieve was a seen into open water, something I knew she could do and the wind was in her favour, the only doubt was the distance. A ten metre run down the bank then into the water and at least a sixty metre swim. My gut told me that maybe today was not the day but when you’re on the line it’s difficult to walk away without trying. The shot was fired and she marked it well. 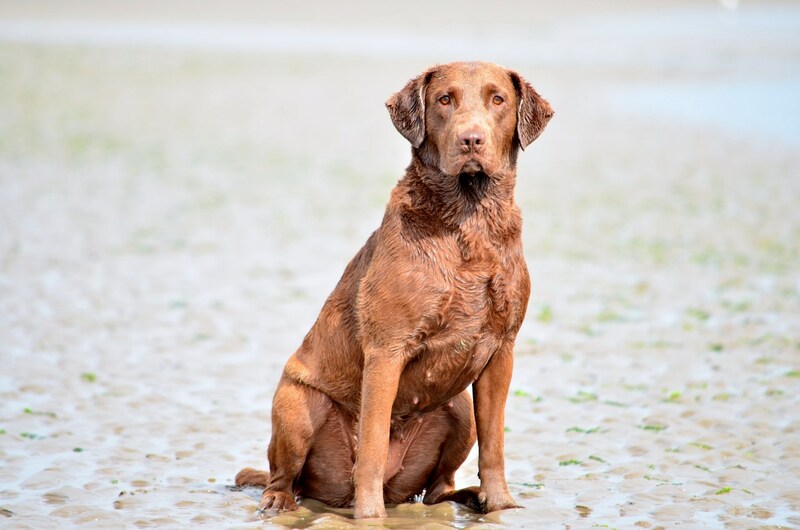 I was asked to send my dog and without any hestitation she took a spectacular chessie leap into the water and swam in the direction she had seen that dummy fall. In my head I urged her on, hoping that confidence and belief in knowing she had seen that dummy come down would pull her on. She got to within ten feet of where her target was and her body language changed. Her ears went back, she hesitated and turned left to the bank where the dummy thrower was. I have not yet taught her to push on back in water so with no ability to steer her I had no option but to pull her in. I set her on the bank and Jason, our working test secretary asked the judge if it was okay to throw a short retrieve in front into the water just to keep her confidence levels up. And again this is another reason I believe these working tests within our club are so vitally important, it’s at those times when a dog and handler are struggling that there is somebody there to step in, put the rulebook aside and do whatever it takes to make the experience a positive one for both the dog and the handler. Uisce finished her day by successfully completing a lovely blind retrieve and listening to the ‘hunt up’ whistle when I asked. Her failures on the day were my fault for putting her into situations that I knew she was not ready for, however, she seems to be the type of dog that can deal with mistakes, shake them off and move onto the next retrieve so I think I’m going to have a lot of fun with her in the future. The competition at Open level was without doubt the highest standard I have ever seen at a Chesapeake working test. Not only had it the biggest entry I have ever seen, ten dogs, but the winning dog scored a perfect one hundred per cent on all of his retrieves. His name is Mattaponi’s Fabulous Niyol and he is still not even four years old! Finishing just two points behind the winner was Niyol’s mother Mattaponis Matoanka. Both dogs are owned by Ms Ursula Moilliet and her husband who travelled from France to compete and boy did they mount a challenge. 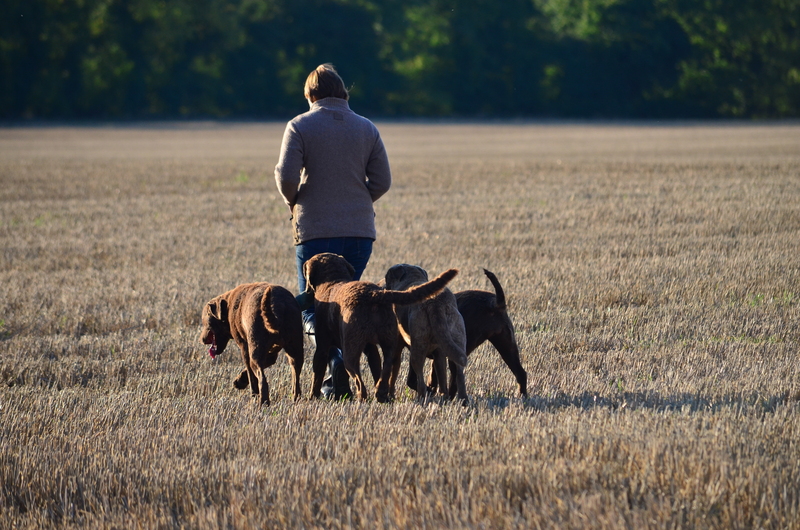 Lovely to watch, her dogs work with drive and style and are truly polished performers. It was an honour to be able to run my dog alongside them. Bertie dropped too many points to finish in the top four on this day but I was still really pleased that he was awarded a certificate of merit. The overseas challenge also brought success in the other classes with my friend Gerlinde’s baby puppy, Cashew, at just 7 months winning the puppy class and Gerlinde’s beautiful girl Lilu finishing second out of a huge entry of 12 dogs in the beginner. And as we gathered in the fading light for the presentation of awards a skein of Canada geese flew over. They were a timely reminder that my dog’s summer of working test competition was finished for this year. Now we would turn with welcome to the mud, wet, wind and cold. Our ears listening for the call of a pheasant or on the water perhaps the whirr of wigeon wings. The winter is long…thank god, Happy Hunting everyone!! As a final note I wanted to say a few words about one very special dog who competed that day. His name is Echo also known as Penrose Quick As A Flash. He is nine years old and Mark, his owner, says this is his last competition. 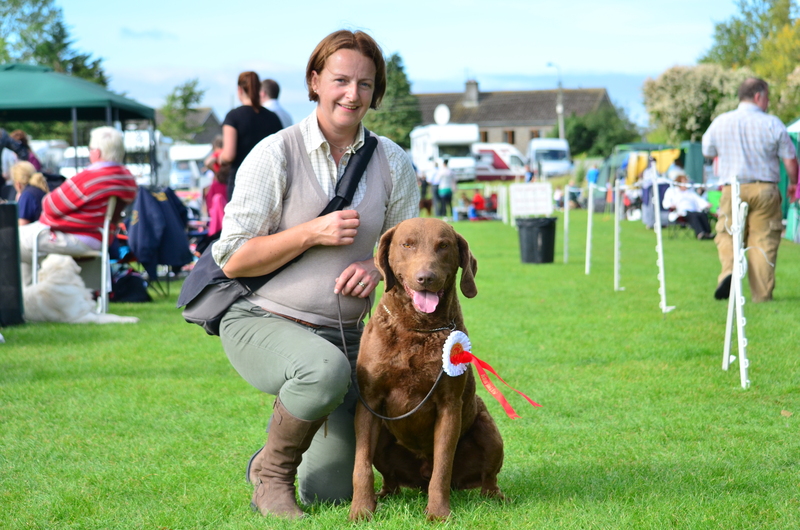 Most good dogs will have one or two seasons where they are at the top of their game in competition but Echo has seen challengers come and go and always remained at the top and even on Sunday he was still challenging for the top spot finally finishing fourth. What I think is most amazing about this dog, though, is that he is a true wildfowling dog. He has never been trained to the top level of polish that many believe is needed to succeed in modern retriever competition yet he always gets there. I hope he will have many more years working his beloved Dee estuary but truly he has left big paws to fill. In my eyes he is the greatest Chesapeake I have seen competing. The legend which is Echo. This entry was tagged dogs, Gundog, long post, nature, short post, writing. Bookmark the permalink.